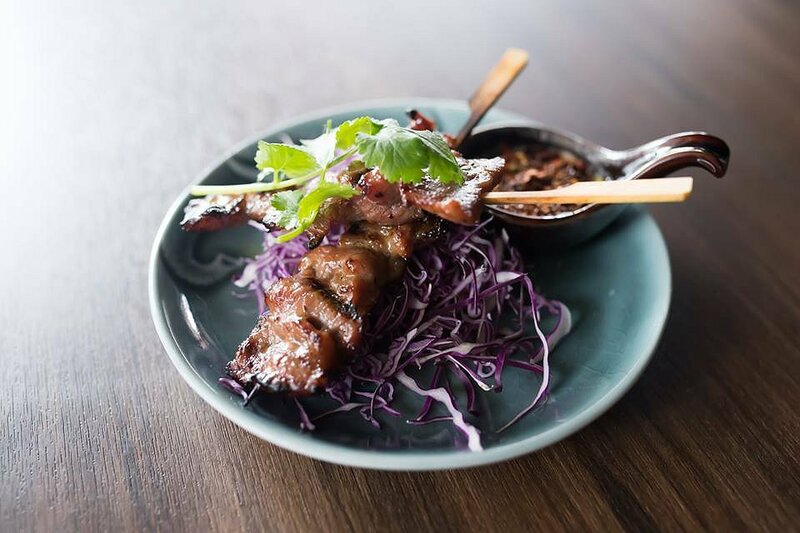 One of Adelaide most popular eat streets, North Adelaide’s O’Connell Street has an abundance of Thai eateries and now there’s a new kid on the block– Zaep Tastes of Thailand. Zaep promises to stand out by the crowd by producing home-style food that is fresh and most importantly not sweet and sugary. A pleasant, aesthetically pleasing space dominated by a black and yellow industrial theme. The tables are well spaced and large enough to allow for easy sharing. The menu is large, divided into smaller, larger, curries, rice and noodles, salad and sides. For those who don’t like to choose a “Thai Feast” for $55 allows you to sit back and be taken care of. The wine list features predominantly South Australian bottles that are familiar and reasonably priced. On this particularly cold and rainy day we sought warmth and comfort food so we focused on curries and a few starters. Gail Golek Nua Satay Moo Ping (skewers) – Unable to decide between the three delicious sounding skewer small plates we went with all 3. It’s a tough call but I’m going to go with the chicken as my favourite. Marinated in what is referred to as Golek sauce the flavour is very tropical with underlying coconut and fruity flavours. 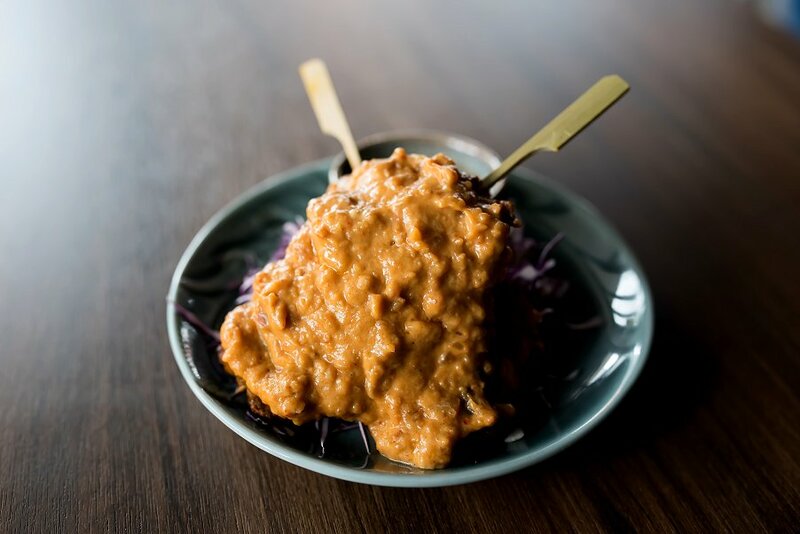 The beef skewers are hidden under a thick and chunky satay sauce. The beef is well marinated so the flavour comes from the meat as well as the delicious topping. The pork were the most simple of the 3. A light thai style marinade complements the pork without overpowering it. 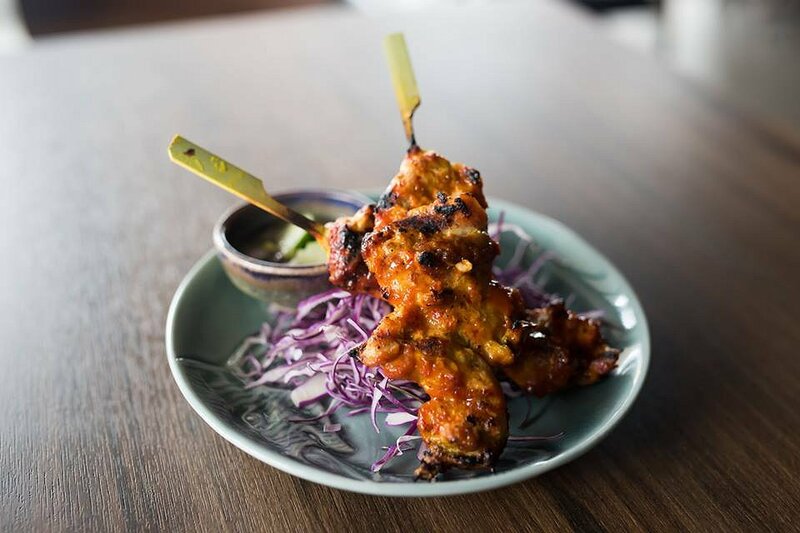 Each skewer is grilled to give the protein a nice char on the outside. Despite being thin cuts of meat they retain a juicy centre. They are all served with a dipping sauce that has the perfect balance of heat, sour and sweet. Duck Pancakes – Thin crepes encase a few slices of duck meat, complete with skin along with a mint leaf, sprig of coriander, spear of cucumber and slices of daikon. 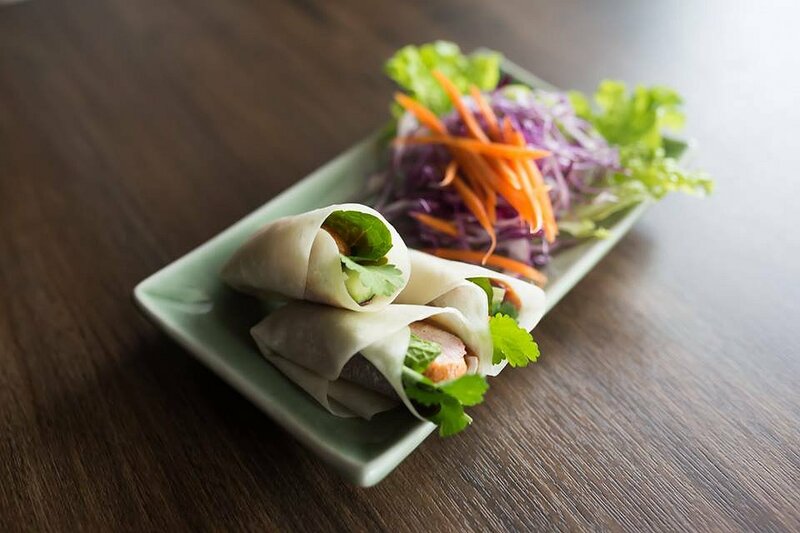 Finished with a special hoi sin sauce the wraps are simple, light and tasty. 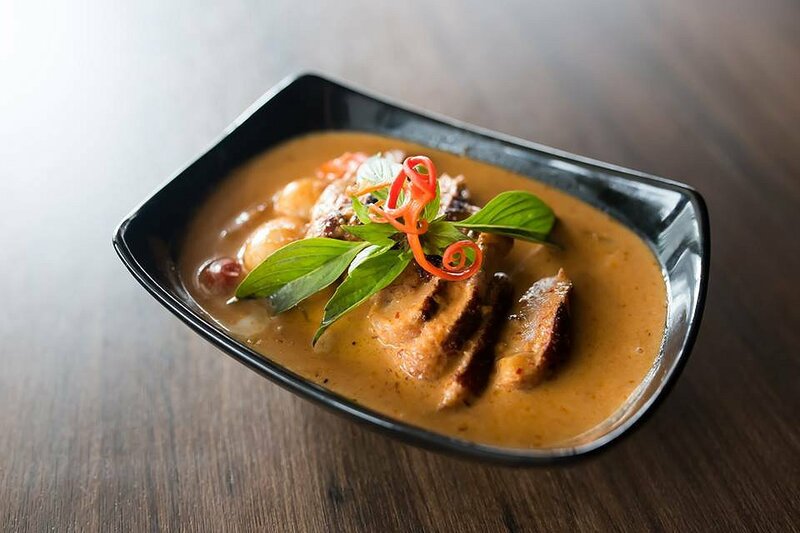 Gaeng Ped – A sliced duck breast, blushing perfectly pink under its dark gold skin, peeks up through a creamy pool of red curry. Naturally sweetened with pineapple, cherry tomatoes, lychees, the sauce carries a pleasant warmth that balances with the tender meat. Fragrant basil leaves draw in their distinct herbaceous note that plays well with the red curry. As it should be, the duck is the hero of this dish, melt in your mouth tender without a hint of chewiness. Gaeng Massaman – A mountainous serve of slow cooked tender ossobuco swimming in a thick and rich curry sauce. The beef is impossible to fault and I liked the addition of the marrow in the presentation. As a massaman should be, the gravy was earthy and nutty and quite irresistible. Best of all there was plenty of it. 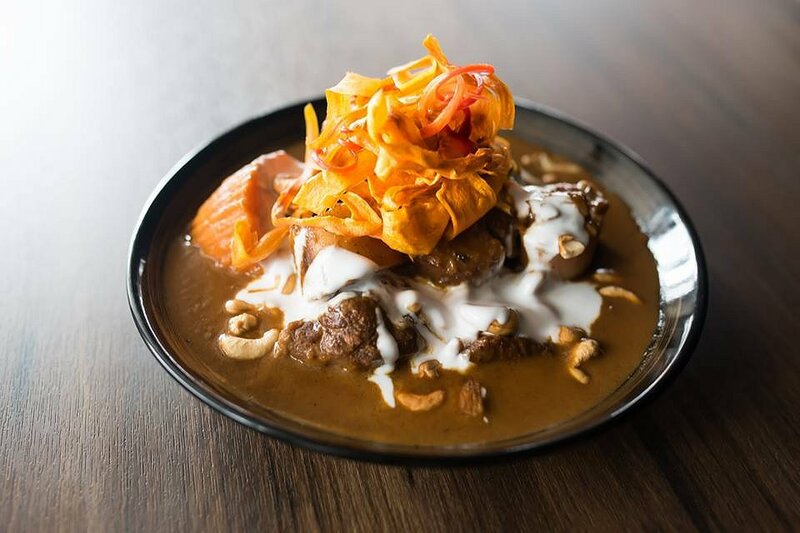 Usually a massaman curry comes with potato, in this case we have large chunks of sweet potato which ties in well with the beef and sauce. Finished with a generous sprinkling of cashew nuts and a swirl of coconut cream. We ordered a side of roti bread so I could mop up that yummy sauce until it was gone. 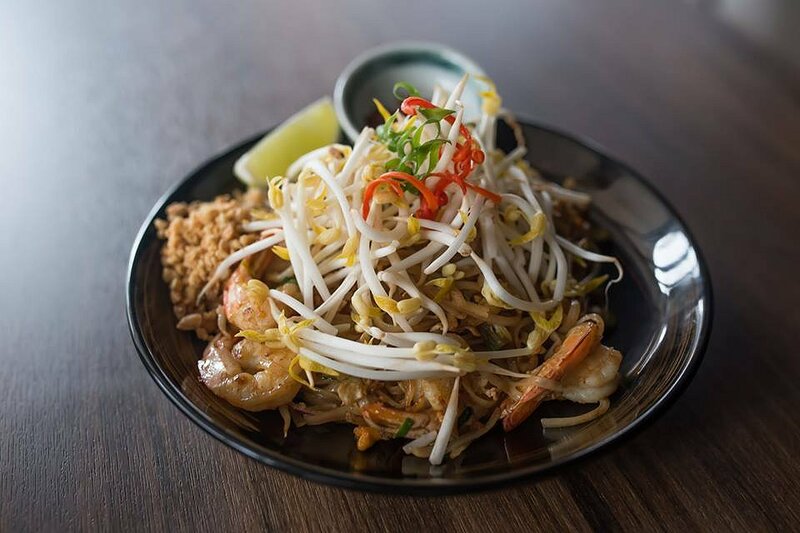 Pad Thai – Again we are presented with a generous serve, the mound of noodles topped with been shoots to allow you to distribute them as you see fit. A wedge of lime, some dried chilli and crushed peanuts also allows a customised touch to the dish. We took up the option to add prawns which worked well with the egg and tofu that was quite abundant in the dish. A mild sauce is stirred though the noodles, enough to loosen them and add flavour but not make them wet. When translated Zaep has two meanings: spicy and delicious. We found this a fitting name for a restaurant that looks set to become an O’connell street staple. It caters to vegetarians and vegans and offers very good value for money. Adelaide Food Central would like to thank the Zaep staff for the hospitality and delicious Thai food.